Yachts to satisfy every need ! Our Royal Yachting Association (RYA) recognized sea school offers a full range of sailing courses from 'Competent Crew' though to 'Coastal Skipper'. Southwest Turkey’s sunny skies, warm turquoise waters, cooling breezes, deserted anchorages and tranquil bays are just some of the aspects that make PORTWAY’s sailing area so special. Warning! 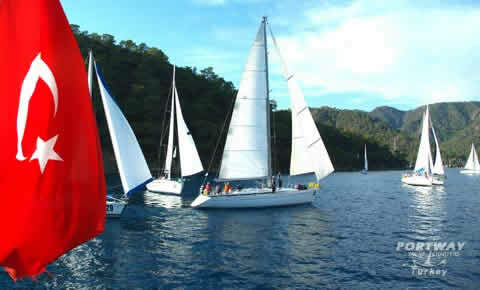 A sailing course here may lead to a change of life style! Check our price list to see available discounts. Scan the QR Code to open our web site on your mobile device. We guarantee the perfect sailing experience! Our dedicated customer service helps you 24/7. Checkout our agent list to find the nearest agent to you. See the answers to frequently asked question by our customers. Conrad, UK:"Just wanted to say a really big thank you to you and all of your staff. The boat, though not new, was in great condition and check in/out was really efficient and relaxed. One of the best charters we’ve ever had"
Phil Pratt, UK: "Best on site experience in 20 years of bareboating." PORTWAY’S TECHNICAL SUPPORT Service provides our boat owners with a comprehensive and professional service throughout the year. Our job at PORTWAY is to make sure that every aspect of boat maintenance is carried out. Discover the Turquoise coast of Turkey. Cruise around the beautiful Islands of Gocek and beyond, anchor in peaceful bays swim in crystal clear waters and view the breath taking and beautiful landscape of the ancient Lycia coast line. Own a boat, need the right partner ? If you have ever thought of buying a yacht why not keep it in the Mediterranean and offset the costs by chartering with PORTWAY? Good reasons to choose PORTWAY for your yacht. PORTWAY respects the environment and takes its responsibility very seriously.